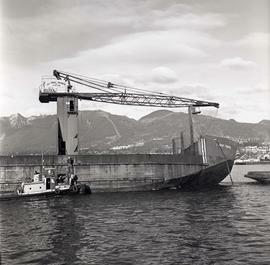 Black and white photograph of the BC Forest Products new log barge being dumped between North Vancouver and Victoria. Boat is named "Forest Prince". Black and white photograph of the BC Forest Products new log barge being dumped between North Vancouver and Victoria. Tug boat is named "Commodore Straits". 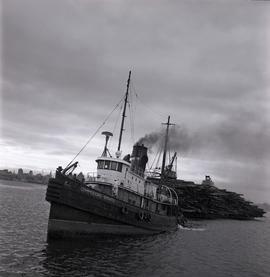 Black and white photograph of the BC Forest Products new log barge being dumped between North Vancouver and Victoria. Photograph depicts the Barque "Garthsneid" at Cape Horn.Four sailors straddling rigging of sailing vessel taking on water. Colour Kodachrome 35mm slide depicts a bay with boats pulled up onto the dry shore with buildings in the background. Colour Kodachrome 35mm slide depicts a bay with boats with buildings in the background and tables and chairs in the foreground. Colour Kodachrome 35mm slide depicts a bay with many boats. Blue Star Line, SS "Canadian Star"
Photograph depicts "Canadian Star", part of the Blue Star Line fleet.Guard rail and flock of seagulls in foreground; freighter in middle of image; star in a circle painted on smokestack of ship; North Shore mountains in background.